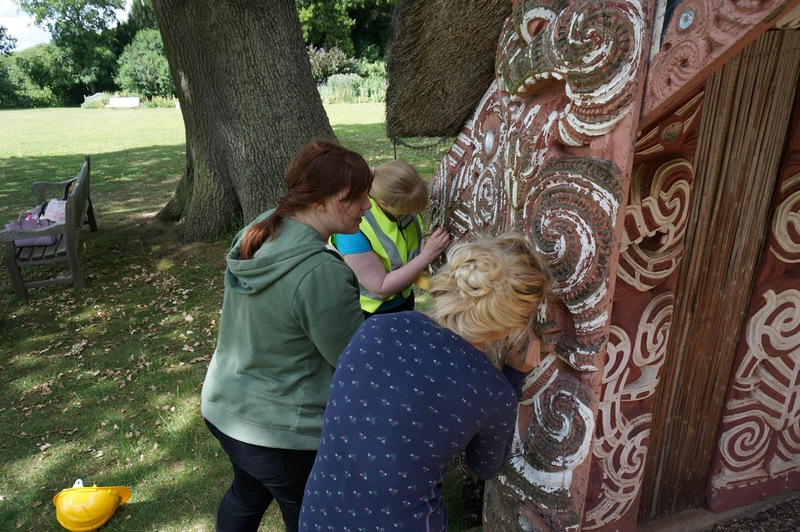 For the past 12 years, UCL conservation students have travelled to Clandon Park to assist the National Trust with the care of Hinemihi, a 19th-century whare nui (Maori meeting house) originally from New Zealand. 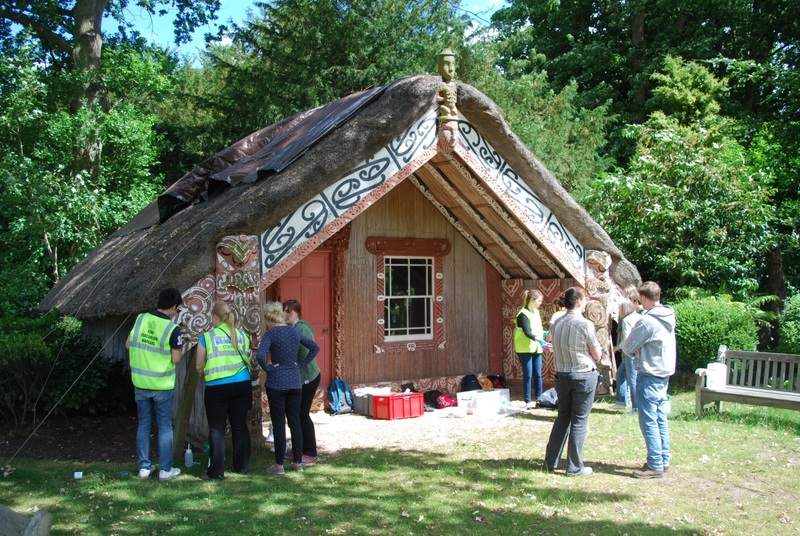 The Hinemihi kaitiakitanga (Hinemihi Maintenance Day), has become an annual tradition at Clandon Park,and is an event that allows us to gain experience with both preserving heritage buildings, as well as with public engagement in conservation. 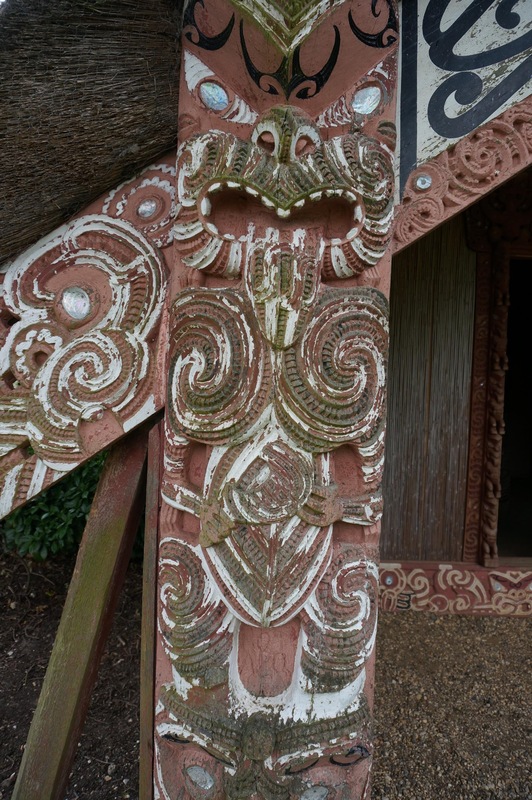 Hinemihi survived the recent devastating fire at Clandon Park and remained unharmed. Whilst the site is currently closed for public access, we were allowed a rare opportunity to work on site, to carry out a small scale maintenance project. This was arranged during the first week of July and five of us were able to take part. Rev. 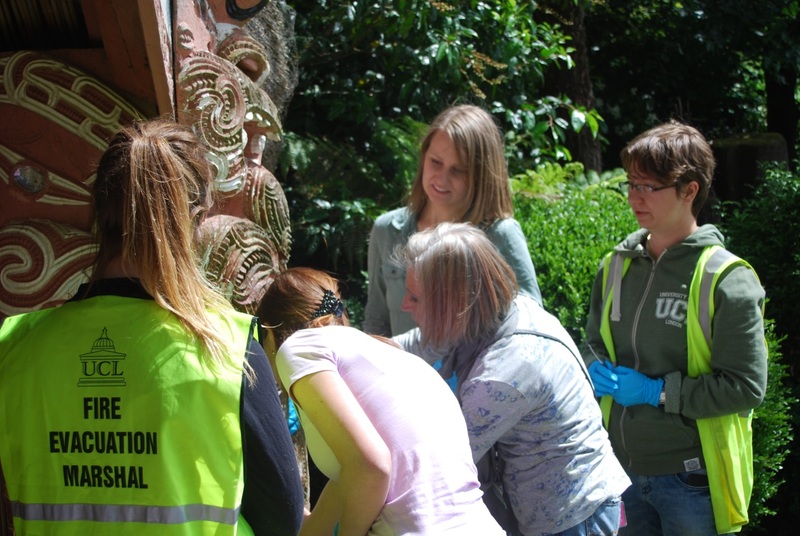 Regan O’Callaghan attended and conducted a karakia in order to clear the way for our work to take place. The mission this year, presented to us by Dean Sully the MSc programme coordinator, was to clean and document the condition of Hinemihi’s historic carvings. The removal of microbiological growth (algae and lichen) is of benefit to both Hinemihi’s appearance, as well as her structural integrity. Our tactic for lichen removal centred first on wetting the microbiological growth, and then on the use of a combination of dental tools, scalpels, and files to clean the wood. When wetting the wood, we used a 1:1 solution of deionised water and industrial methylated spirit (IMS). This helped loosen the growth and allowed for careful scraping, without damaging the delicate painted surface. Though a variety of instruments were used, my personal preference was a metal file— it provided an edge to remove the lichens, but was not as sharp as a blade, and therefore I avoided cutting into or damaging the wood. The results were very satisfying, as one could note an immediate change to the surface once it had been attended to. One of our favourite parts of the day was teaching these cleaning methods to National Trust staff and volunteers who work at Clandon Park. Though we wish we could help with the preservation of Hinemihi more often, time and distance preclude this from happening. 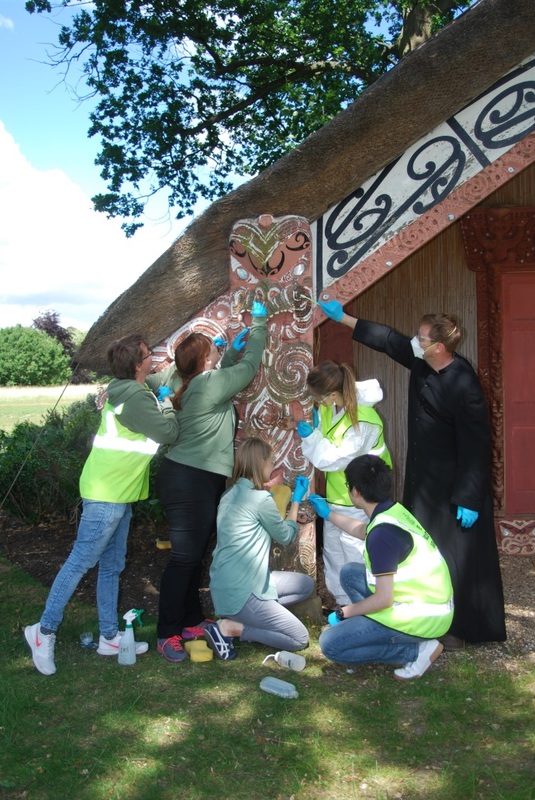 It is therefore very important to help train others how to carry out conservation cleaning, so that they may continue Hinemihi’s maintenance in the future. We had a great time working on Hinemihi’s care at Clandon Park. 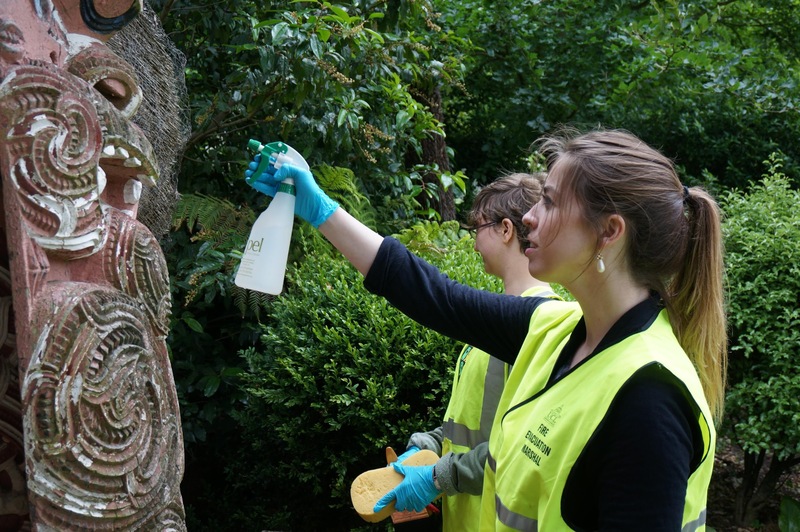 For a group of (in-training) object conservators , who often focus on smaller-scale treatments, it was wonderful to expand our breadth of knowledge to include a large-scale heritage site. I can’t wait until next year!